Discussion in 'Epson InkJet Printers' started by Alan Baily, Jan 17, 2015. While trying to clean out my printer, I had a streaking problem. While trying to fix that, I replaced all the inks, rest all the chips, and now I get the left two lights blinking together. The printer is now unusable until I solve this problem. From research, it is hard to tell what the problem is. I am pretty sure nothing is caught inside. Does anybody have any suggestions? 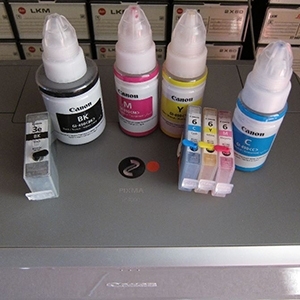 I have posts on the InkjetMall website forum where there is more detail. The streaking problem is secondary to the blinking lights problem. I cannot answer your question as I know next to nothing about Epson printers, but maybe the service manual will be useful? Even if the link text does not suggest so, the R2880 model is also covered by this service manual. Thank you for your help but I have a manual but it is not helpful. Also, your link does not open. I believe I have solved my problem. It was a waste ink reset issue. I downloaded the software that gives a count, which turned out to be 91% and 26%. I did not know if I needed it to be closer to 100% but I tried it anyway. It solved my problem of the blinking lights. Now I only have to clarify why, after many cleanings, the nozzle check shows no lines for the cyan and a few broken up lines for the photo black with all the other colors printing normallly. It is not likely the waste ink counter. I would have put money on some liquid getting into the contacts of the printer carriage. These are the electronic contacts that touch the printer cartridges. If liquid gets in there and it shorts the liquid sensor lines, that is part of the ink out sensor circuit on OEM cartridges. it will give an error condition and the cartridge will not be accepted. Be careful whenever injecting liquid into the intake ports or getting those contacts wet with liquid...or messing with liquid within the printhead carriage area. Normally after some time, it will dry out and normal operation will resume. The quickest resolution to that is to use canned air and blow in front of as well as into the spaces behind the chip contacts on printer carriage. The waste ink counter is not a "close to" or Approx call. It is either over or under the count as an absolute as any preprogrammed machine would be. Also be careful of applied pressure and head delamination. The "General Error" is a frankly useless one as it can be so generic and uninformative but it's also unlikely that the waste ink counter was involved if the percentages weren't at 100% on at least one of the counts. If you do ever figure out what else might have changed when you did the waste counter reset please do let us know. Mysteries like this are useful in helping with other "who-dunnit" conundrums. As I do have a life outside fixing this printer, I have not been able to devote much time to this. I was getting good responses from Dana on the forum at Inkjetmall but she has not responded this week. As I clarify my issues I will report back. As I can't seem to get a good nozzle print, I am concerned that one of the nozzles might be damaged, by me, when I tried to clean it. As I do have a life outside fixing this printer, I have not been able to devote much time to this. I was getting good responses from Dana on the forum at Inkjetmall but she has not responded this week. As I clarify my issues I will report back. As I can't seem to get a good nozzle print, I am concerned that one of the nozzles might be damaged, by me, when I tried to clean it. Epson printers are pretty robust and while it's possible I wouldn't stress overly just yet. The most obvious end-game with Epsons is if you should find that ink injected into one receiver (the little spiggot that pushes into the base of the cartridge) is jetting out of another one. If that happens you have delaminated the printhead (ie: blown it apart) and it's non recoverable. If it helps, we are currently tackling an R2400 that has been out of use for more than 2 years and worst of all has not had any cartridges in so the receivers have been open to the air throughout and everything is clogged. 2. Use the passive cleaning approach detailed in this post to work the problem from beneath. 3. Use the above process for more than a week without actually turning the printer on or running any nozzle checks or head cleans. The goal being to let the solution do the heavy lifting without any pressure and at it's own pace. The results so far are that some of the inks are starting to break down in the nozzles and that's evidenced in the pads we've had under the printhead. I'm only indicating our scenario because it's an absolute worst case so if you apply the same sort of patient approach you should eventually prevail. In this instance the passive approach works because you have a "life" so it's a win win. I will try the passive approach. Hopefully, it is a win-win. Since the printer has worked recently, about how long should I let it soak? Also, I will check to make sure that there is actually some ink in the cart. websnail and The Hat like this.